A passion for authentic Mediterranean cuisine and a spectacular terrace overlooking one of the most fashionable lanes in Capri make the Relais La Palma restaurant and bar one of the most exclusive hot spots for an evening on the town. When you choose a restaurant like Relas La Palma, you can be sure you are about to have an unforgettable evening marked by gourmet cuisine, an elegant atmosphere, and a touch of island glamour! Book a table on the restaurant's terrace and sample the most authentic Mediterranean dishes, traditional recipes, and island specialties, all paired with an excellent wine from their vast wine list. 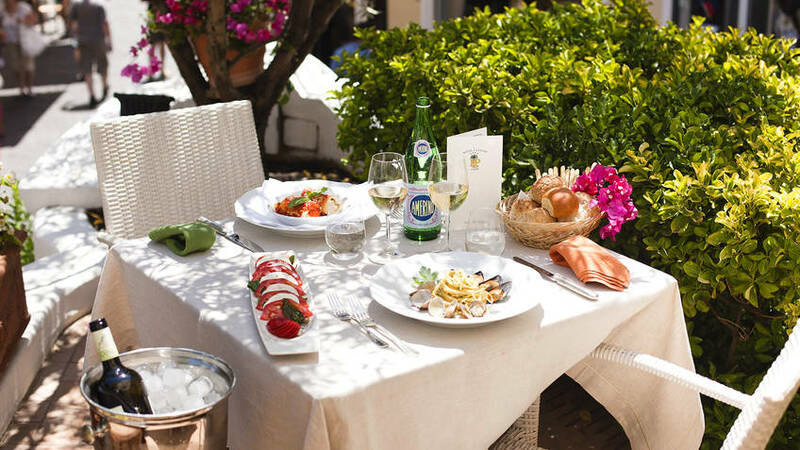 One warm summer nights, the lit candles and soft lighting in the garden create the perfect romantic atmosphere for a dinner for two overlooking the chic lane below, in the heart of Capri's exclusive designer shopping district. Spend a day at sea, enjoy the glamorous nightlife in Capri with an predinner aperitivo cocktail, a relaxing dinner, and an elegant nightcap at Relais La Palma, where the most elegant VIPs on the island gather each evening. On the terrace or at the bar, you can settle in to enjoy the island's nightly cocktail hour, have dinner, or unwind with an evening of live music against the romantic backdrop of Capri town. Relais La Palma can also be booked to host your stylish event or reception in the internal dining rooms, the covered patio, the gazebo, and the roof garden are all unforgettable venues for receptions and gala dinners for up to 360 guests.